The Payday Hound aims to help you make informed financial decisions. Learn about payday loans, installment loans, and financial products in general. Learn about borrowing, fees, rates, and payments. Our articles can help you make informed financial decisions to protect yourself and save money. Get the facts so you can make a decision that's best for your situation. Payday loans are not a good choice for longer term borrowing needs. 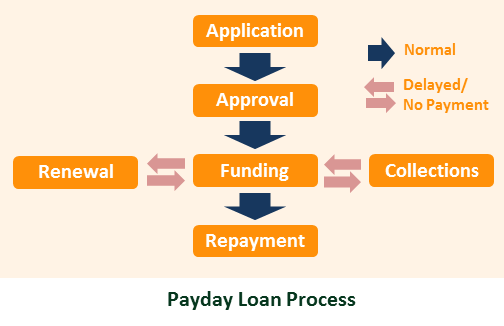 Rolling over or renewing payday loans greatly increases costs and often times alternative options provide cheaper funding. Payday loans can be cheaper when compared to bank overdraft fees and late penalty fees when they are paid off at the next payday but are more expensive than credit card advances or bank loans so if either of the later options are available they would be a preferred pick for us. The application is designed to identify you, to verify how you get paid, and to connect the lender to your checking account. For ID verification, general personal information like your name, date of birth, drivers license, and social security numbers are required. For payday information, applications ask for employer name, and paycheck amount, pay day, and frequency. For checking account information, they ask for your bank routing number and checking account number. Some applications ask about home ownership and direct deposit and for references. All of this is done online. Loan approval generally happens within seconds. If your data does not match the ID verification databases, lenders may ask for supporting documents like pay stubs before they can approve you. Once approved, the lender will direct deposit funds into your checking account usually by the next business day. On your next payday, the lender automatically withdraws funds from your checking account to repay the loan plus fees. In most cases, this happens without additional notice to you, so make sure you have adequate funds in your account to repay your loan. See Renewal below if you are unable to keep adequate funds in your account. Many times, the lender provides an option to renew if you notify the lender a couple of days before your next payday. If approved, the lender will only withdraw the fees owed and not the principal amount of the loan. Then, on the following payday, the principal and ADDITIONAL fees will be withdrawn. There is a limited number of times that a payday loan can be renewed. This is often mandated by law and beyond the control of lenders. The number of renewals vary, but is generally around 3-5 times per loan. We have recently read in the news of stories of lenders that automatically renew your loan so they can charge additional fees. When taking out a loan make sure you review your terms and contact your lender if you do not want to renew. If you don’t have enough money in your checking account, the lender will continue to try to withdraw money from your account until your full principal and fees are paid. Additional fees, on top of fees your bank may charge you for overdrafts, will continue to be charged if your principal is not paid. These fees add up very quickly so be very careful to pay you loan off in time or to alert you bank and lender if you are unable to pay. If the lender is unable to collect its fees and principal, it may sell your loan to a collection agency that will continue to try to collect money from you. Payday loans are a double edged sword. They provide short-term, emergency funding, and can be cheaper than overdraft fees or penalty fees but can be disastrous to you if used incorrectly with fees piling up very quickly. We hope The Payday Hound can help users use payday loans to their advantage by helping users determine if a payday loan is right for them, and then, if it is, find responsible lenders. The Payday Hound aims to bring informed reviews and rankings to the online space. We want to arm users with information to protect themselves and, if necessary, find the payday loan best for them. We have not found many other review sites and the ones that exist do not seem to be updated or carry a very limited selection of reviews. This is why we launched The Payday Hound. Even at launch we now review more than five times as many lenders as other sites and continue to review more lenders every week. Anyway, thanks for checking in and we hope you enjoy The Payday Hound and look forward to hearing your comments and suggestions. The key difference is that payday direct lenders are responsible for underwriting, funding, and servicing your payday loan whereas payday loan matching services only collect your information, screen it, and then send it to lenders. In other words, payday matching services act as the middle person between you and the lender that will be servicing your payday loan. In general, payday direct lenders provide pricing estimates before you apply so you know what your costs will be beforehand. Some of our most popular payday direct lenders include CashNetUSA, Ace Cash Express, and Check City. The above lenders are state-licensed lenders and our top picks by The Payday Hound. Payday matching services connect you to a network of payday loan lenders, including some offline payday loan lenders (or lenders who have no online presence other than through a payday loan network). The main benefit of payday matching services is convenience, as you only have to fill out one application and the matching service will send your application to multiple lenders. If the first lender rejects you, the matching service will send it to the next lender on its list until it finds one that accepts you or it has no more lenders. If the matching service finds one that accepts you, it will send you to that lender’s website, directly to the loan agreement form with loan terms. If it does not find a lender, then you will be notified that you have been denied. This all happens within a matter of seconds. The benefit of this process is that it eliminates applying to multiple payday lenders individually until you are approved for one. Fees are only provided after you are matched with a lender. Any fees advertised on a matching service site should be looked at with caution, as the actual fees will vary. These services do not provide a list of lenders in their network. Instead you just apply to the network meaning you can’t choose which lenders to whom you want to apply. The first lender that is matched will be the option available to you. In other words matching services do not try and find the best lender for you but the first one that will take you. If you choose to use a matching service, we suggest you research and compare pricing for the lender with whom you’ve been approved lender to determine if your loan is really the best option for you. You can use sites like the Better Business Bureau to check for complaints. You can also check back on our payday lender reviews. If the lender has not been reviewed, please send us an email at moc.dnuohyadyapeht@kcabdeef with a link to the lender and we will review it.